I don’t really know what time my Grandparents usually wake up, but I’m guessing it’s pretty early, because when I awoke sometime between 8 and 9, they gave the impression they’d been up for a while. I had my first shower and shave in a couple of days, and discovered that I don’t think I like English showers any more than I like American ones. As I was to discover in the coming weeks, the Brits aren’t great ones for streaming hot showers. The water pressure is simply not up to the standard of your average Australian shower. But no matter, when it’s been two days, you take any shower you can get. After breakfast, which consisted of Grandad and Gran’s particular mix of breakfast cereals, sultanas and low fat milk, we headed out to look around. We stopped in a little country lane for a look around the place where my mother grew up, and some of the massive greenhouses that they’ve built recently in the area. I was left wondering what they do in a really bad hail storm. Then we went on to Chichester. 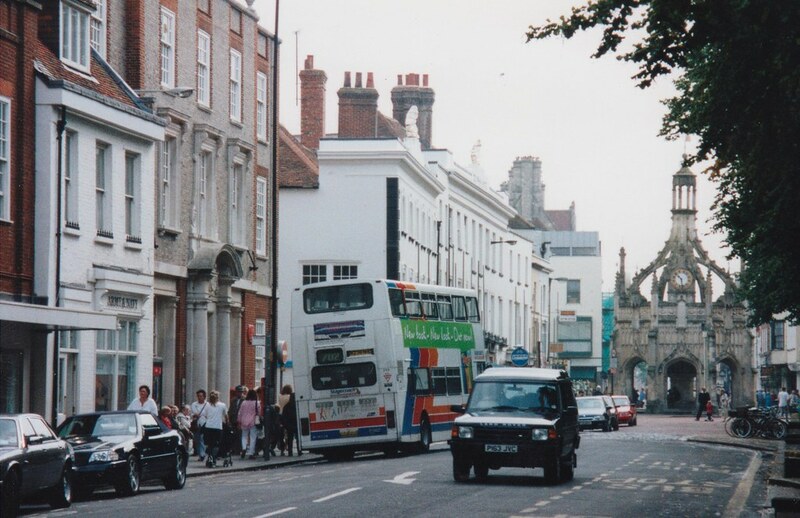 West Street, Chichester, looking towards the Cross, aka that bloody ornate thing in the middle of the road. Australia was settled by Europeans about two hundred years ago, and in the big cities where most Australians live, there are not too many traces of life from before that time. If we see a building from the 1850s that’s still standing, we’re impressed. “Wow”, we think “that’s old”. So it’s a bit of a shock to the system when you go to somewhere like Chichester, which has a cathedral 1000 years old, and sections of Roman wall that date back to 50AD. I took a deep breath, put my hand on the wall to feel it, and marvelled at the workmanship. Because let’s face it, anything man-made that has lasted almost two thousand years has got to be pretty well made. I dare say your average picket fence around a front garden won’t still be around in two thousand years. The funny thing is, this was no museum. It was just a street in Chichester – actually a very boring street with a factory on one side and a carpark on the other (well, over the wall, that is). No plaque, nothing really to distinguish it. Just a two thousand year old wall sitting there, being wall-like. We walked along to the cathedral, stopping to admire the big Cross in the town centre, where the main streets meet. (I forget the exact name of it; it might have been the Market Cross.) This is probably where they came up with the word crossroad, and I suspect how the roundabout was invented. When something as big as that is slap bang in the middle of the road, you’ve got no choice but to go around it. And the Cathedral itself was pretty impressive, too. With all sorts of gravestones and memorials and trinkets and things reminding you that it had been there for about a millennium. It was so old that when they built the bell tower, they apparently hadn’t thought of putting it on the top of the church – instead it was a separate building. We looked around the shops, which when first glancing at them and looking at the names, look interesting and foreign, but turn out to be camera shops and chemists and supermarkets and greengrocers, just like at home. The Chichester McDonald’s is in the 1700s Corn Exchange building, but as we walked past I peered in, and was not astonished to see that inside it looked just like every other McDonald’s the world over. Leaving Chichester by a highly confusing network of one way streets, we made a short stop at the family burial plot, in a churchyard somewhere between Chichester and Bognor Regis. There several Bowens (and de Bowens; my Grandad decided to change the family name) have been laid to rest. We then went on to Bognor to visit some very much alive relatives: my Uncle Kevin, his wife Liz, and their baby son Luke. Uncle Kevin has truly obtained legendary status in his role as an Uncle. “UK in the UK”, as my sister and I knew him when growing up, always sent the most humorous and interesting letters, the best presents, and the funniest cards. This is the kind of guy who even though you’ve never met him face to face, you just know you’re going to like. And I did. Luke and Liz were delightful too, and we scoffed down tea and biscuits and generally had a merry old time. Having made a date to go out on an excursion later in the week, I headed back with my grandparents for lunch at their home, followed by a stroll along the beachside path. I reached as far as a town called Felpham, along the way consuming an icecream (which seemed cheap until I realised that with the pathetic Australian exchange rate, 70p is more than $2), and spotting rabbits hiding underneath some of the beach huts. I took my time getting back, and that evening we settled down to the TV to the news of the Swissair crash off Canada, which made me glad I had already arrived, and wasn’t sitting at home about to fly out, watching the story and dreading the journey. The British TV news is a bit odd, I reckon. In Australia, a half hour bulletin might cover ten or fifteen stories, both major and minor. Some will get several minutes, some will get just a few seconds. But in the space of the fifteen or so minutes dedicated to news (the rest might be sport and commercials), you get a fairly good idea of what’s going on in the world. But not in Britain. Their TV news’s all seem to go in-depth on just a handful of stories – maybe only three or four. They’ll have live crosses, computer simulations, background information, expert analysis, public reaction… it left me feeling utterly bored of just about every major event that was happening, and wondering what else was happening in the world. I got more information about Bill Clinton’s illicit bonking in the three weeks I was in Britain than in months of watching news at home. And there was even more about Clinton while he was in Ireland, including one news broadcast where they kept crossing to some little town in Ireland because he was about to get out of his helicopter and go for a stroll around. In fact apart from Clinton, Swissair, Ireland and some Fujitsu factory closing, I honestly can’t remember seeing any other stories covered in the dozen or more news bulletins I saw over there. Anyhow, we wrapped up the evening with multiple cups of tea and Cool Runnings on ITV.